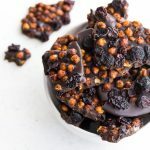 Cinnamon Raisin Chocolate Chickpea Bark is a protein-packed treat with crunchy cinnamon roasted chickpeas, plump raisins and dark tahini chocolate! Drain and rinse chickpeas and roll out onto a clean dish towel. Pat dry. If you want to remove the skins (this is optional), rub chickpeas between two dish towels until skins loosen. Remove and discard skins. In a medium-sized bowl, add chickpeas, coconut sugar, cinnamon, maple syrup, oil and salt. Toss until chickpeas are well coated. Add chickpeas to the air fryer basket and cook on 300F for 20-25 minutes (see note below). Stir or toss at the mid-way point. Chickpeas are done when they have darkened and are completely crispy. If they are soft in the middle, keep roasting them. (Check notes for oven option). Add the chocolate and tahini to a microwave-safe bowl, and microwave for three 30 second intervals, stirring in between each interval. Stir until chocolate is smooth. Line a baking sheet with parchment paper and spread the melted chocolate out into a thin layer. Sprinkle on the roasted chickpeas and raisins and press them into the chocolate. Place in the freezer for an hour, or until chocolate is set. Break into pieces and store in an airtight container in the freezer. I used the Cuisinart AirFryer Convection Oven to roast the chickpeas. You may wish to adjust the cook time and temperature slightly based on the make and model of your air fryer. To roast chickpeas in the oven, pre-heat oven to 425F, spread chickpeas out on a parchment paper lined baking sheet, and bake for 30-40 minutes, or until chickpeas have darkened and are completely crispy. If they are still soft in the middle, keep roasting them. Stir the chickpeas every 10 minutes to ensure they don’t burn.